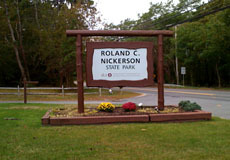 Travel the road to the upper campgrounds in Nickerson State Park and you may think for a moment that you have been magically transported to the Berkshire Hills or the piney woods of the Carolinas. Nowhere in sight are the sand dunes and salt marshes usually associated with Cape Cod. Instead, you are surrounded by woods that slope down to the banks of eight crystal clear fresh water ponds. Yet, if you walk or bicycle through the woods, you will find no rivers or streams feeding the ponds. These are “kettle ponds,” among more than 300 formed as glaciers retreated from the Cape over 10,000 years ago. Completely dependent on groundwater and precipitation, the water level in the ponds fluctuates from season to season and year to year. DENNIS ? The monthly water rescue drill was held today on the Bass River at the new bike foot bridge. Members of the Barnstable County Tech Rescue Water Operation Team took part in the drill today. Firefighters from all across Cape Cod are members of this team. Their drill took them to the Dennis Allaire [?] The post VIDEO: Cape Cod Tech Rescue team holds monthly water rescue drill appeared first on CapeCod.com. The Barnstable County Regional Dive Team will be conducting its monthly drill today in Bass River off the Route 6 overpass near the new Cape Cod Rail Trail bridge, according to a Dennis fire official. At 9 a.m. the dive team was expected to begin preparations and then be in the water by 9:30 a.m. practicing ?rapid water rescue techniques? in the area’s strong current, said Dennis Deputy Fire Chief Robert Brown. Deck: Something new every day?Towns: BarnstableTopic: BusinessHub Category: BusinessAuthor: CapeCodToday StaffTeaser: Something new every day?Main Image: Thumbnail Image: Body: Here are today?s job postings from MassHire in Hyannis: If you are interested in one of these positions send your resume to mgolden@masshire-capeandislands.com and indicate the job that interests you. Job #1 ? Emergency Telecommunicator ? Upper Cape Full Time: Will? BARNSTABLE ? The West Barnstable Shooting Range is now under the oversight of the Barnstable Police Department. The state has approved the plan proposed by Barnstable Town Manager Mark Ells, which will take 27-acres of town land out of conservation to offset the conservation land lost to the range. Ells also has? .